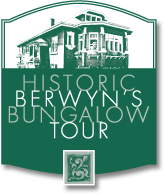 Historic Berwyn's Bungalow Tour - Sep 30, 2018 - Why Berwyn? - Why Berwyn? Website: Get more info here! Join the Berwyn Historical Society for the 12th annual Bungalows and More Tour on Sunday September 30, 2018, from noon to 5:00pm. Tour goers will be led by docents while viewing the interiors of selected homes. This year we celebrate 40 years of the Berwyn Historical Society by touring homes and businesses in and around our Historic Depot District. Our first order of business as an organization was to start the movement to save our train station, so we are proud to highlight the area around what is now an iconic Berwyn image. Check-in will be at the Berwyn Depot Train Station, 6801 Windsor Avenue, from noon to 4, with houses being open until 5. Tickets can be purchased at berwynbungalow.org. All proceeds benefit the Berwyn Historical Society, a non-profit organization whose mission is to preserve, protect, and promote architectural and historic resources in Berwyn through advocacy and education. Tickets available soon. For more information, visit berwynbungalow.org.